I offer tailor made fly fishing and fly casting lessons based in Dublin Ireland. My approach to teaching is based on providing a simple, uncomplicated set of exercises that allows students to go home from a lesson and practise with a full understanding of how to make a good efficient cast with a fly rod. I believe the most important thing in teaching fly fishing is that students can self diagnose errors and practise with confidence by understanding what the fly line should look like as it travels through the air. 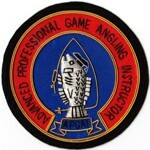 As an APGAI qualified Instructor I have been assessed in my ability to provide fly fishing instruction to the highest standard available and hold full Public Liability Insurance.